The Lord has left us a mystery to contemplate. It is right there in the middle of the “Our Father” when Jesus teaches us to pray, “Give us this day our daily bread.” (Mt. 6:11) This is generally recognized to mean pray for our basic daily necessities. (CCC 2837) This is true. Yet, hidden in the mundane and seemingly redundant word “daily” is the veiled, mysterious Greek word epiousios (επιούσιος). Epiousios is a unique word, sacramental-like in nature, a visible sign of a hidden reality. Epiousios occurs nowhere else in the Greek Bible except in the same Our Father passage in Luke 11:3 and the Apostle’s Didache. In fact, epiousios is not found anywhere else at all in Greek literature. The only recorded reference to epiousios, ever, is Jesus’ prayer. As the early Church Father and master of the Greek language Origen (d. 254 AD) concludes, epiousios was “invented by the Evangelists.” The millennia have bore out his assertion that epiousios was a new word, a neologism of uncertain etymology. The usual Greek word for “daily,” hemera, is, after all, used elsewhere in the New Testament, but not in this instance. Why did St. Matthew and St. Luke feel compelled to create a new Greek word to accurately reflect the words of Jesus? They most likely had to use a new word to faithfully translate a novel idea or a unique Aramaic word that Jesus used in His prayer. What was Jesus’ new idea? Although there are multiple levels of meanings to epiousios, Jesus is making a clear allusion to the Eucharist. “Our daily bread” is one translation of a word that goes far above our basic needs for sustenance, and invokes our supernatural needs. This eschatological interpretation is also borne out in the parable for the “coming day’s bread,” that Jesus teaches immediately following the Our Father. In Luke 11:5-8, Jesus tells the story of a man, who at “midnight” asks a friend to lend him three loaves of bread, as another friend of his has arrived from a journey and he has nothing to give him. As scholars have noted, there is the crucial matter of timing in this parable. In the morning the man can provide an abundance of food and bread for his guest, but at midnight he has nothing. This is an allusion to the fact that in the coming day of the Lord in heaven we will have a superabundance to meet our every need, both material and spiritual. But, as of yet, in this temporal life, a constant need remains. Ours, like the man in the parable, is a matter of timing. We desire to have a measure of that superabundance now, and not just to meet our needs, but also to share with others. Thus, in praying today for tomorrow’s bread, we are praying to realize now, in time, a bit of the fulfillment of eternity. This is in line with the theme of “realized eschatology” that runs through the Our Father, in which we pray for “Thy kingdom come, Thy will be done, on earth as it is in heaven.” Even now on earth, we share daily in the realized eschatology of the heavenly Mass. In asking God for our daily, supernatural bread, we are also reminded of the manna from heaven that the Israelites supernaturally survived on in the desert for forty years. In the exodus, where there was no food or water in the desert, God miraculously rained down bread from heaven each day, both a supernatural and daily occurrence. In the morning dew, they gathered manna for their daily sustenance, and in the evening they ate the flesh of quail. As the psalmist says, “Man ate of the bread of the angels,” and “He rained flesh upon them like dust.” (Ps. 78:25; 27) The Israelites ate of the heavenly bread and flesh from the time they crossed the waters of the Red Sea (a foreshadowing of Baptism) until they reached the Promised Land (a foreshadowing of heaven). Then, as soon as they completed their journey, the heavenly manna ceased. (Joshua 5:12) Our daily manna is with us too from the time we enter into the Church until the time we cross over into eternity. Jesus makes a direct connection of Himself to the manna from heaven, calling Himself the “Bread of Life.” The Jews, citing Moses and the manna from heaven, demanded a similar sign from Jesus. In response, Jesus tells them, “I am the living bread which came down from heaven; if any one eats of this bread, he will live for ever.” (Jn. 6:51) Jesus is the new Moses, leading a new exodus, with a new heavenly manna. Like the Israelites’ manna, Jesus offers His bread and flesh for us to survive on for our journey. 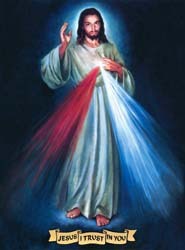 He tells them “he who eats My flesh and drinks My blood has eternal life.” (Jn. 6:54) Evidently Jesus wanted to make sure His scandalous words were not glossed over, because He repeated six times that those who eat His flesh and drink His blood have eternal life. This theme of “eating and living forever” is mentioned in only one other place in the Bible – in the Garden of Eden with the Tree of Life. After the fall of man, God sent Adam and Eve out of paradise, lest he “take also of the tree of life, and eat, and live for ever.” (Gen. 3:22) However, now with the Incarnation of the God-man, Jesus, paradise is, at last, opened fully to humanity to “eat and live forever.” The Tree of Life, cut off to us by our sins, is now open to us through the tree of the Cross, and resurrection of Christ. The fruit of this tree is given to us sacramentally in His supernatural manna, the Holy Eucharist. It is our spiritual bread without which we cannot live. Thus, Jesus is making a direct reference in the Our Father for our daily supernatural bread of the Eucharist. As Jesus instructs us in the beginning of the Bread of Life discourse to not work for “food that perishes but for the food that endures for eternal life.” (Jn. 6:27) The theme of bread runs through the life of Christ, as visible signs pointing to a hidden reality. He is a priest-king, the order of Melchizadek, who offered bread and wine. He was born in Bethlehem, Hebrew for the “house of bread.” He performed the miracle of the multiplication of the loaves to feed 5,000. He refers to Himself as the “Bread of Life,” the true manna from heaven. In the culmination of the Last Supper, the Passover feast and the feast of Unleavened Bread, He offered bread and wine as His Body and His Blood of the New Covenant. After His Resurrection, He revealed Himself to His disciples in the “breaking of the bread.” Jesus lives on with us sacramentally in the Holy Eucharist, under the guise of bread. In the final revelation He promises to give us “some of the hidden manna.” (Rev. 2:17) This is our food of salvation, our medicine of immortality, which gives eternal life. It is not surprising then that the disciples beseeched Jesus saying, “Lord, give us this bread always.” (Jn. 6:34) And, so it remains with us. This entry was posted in Eucharist and tagged bread, bread of life, daily, epiousios, eschatological, Eucharist, exodus, Jesus, Latin, Lord's prayer, manna, manna from heaven, Our Father, St. Jerome, supersubstantial, tomorrow's bread, Vulgate on December 5, 2016 by Brian.